Get a Fast and Free Quote on Custom Logo Mats for your Event or Business Today! 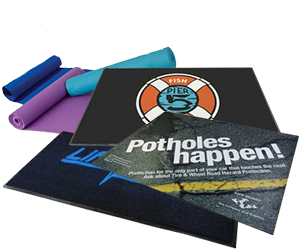 When you think of logo mats as wholesale promotional items, think beyond floor mats. Although floor mats make great custom promotional products, there are other areas to address as well. The one commonality is that all the wholesale promotional products which are mats each carry your logo, brand name, or specific design. Now you only have to narrow it down to which type of mat you want. What audience will your personalized promotional products serve?